Everyone interprets evidence according to their worldview. If you find evidence that might somehow seem to conflict with reality, one is forced to come up with a rescuing device to protect their worldview. People are usually more concerned with protecting a worldview than knowing the truth. Here’s an example: Humans were not supposed to have started working with aluminum until about 200 years ago (materialist worldview), so aliens must have visited earth 250,000 years ago (rescuing device). So, instead of the Biblical worldview, which states that mankind was working with metal just 7 generations after Adam (Genesis 4:22) , someone, who has a naturalistic worldview will need to fabricate stories about aliens bringing complex metal workings from other galaxies as a rescuing device. DNA has verified half-life of 512 years. The extrapolated maximum time that DNA is readable under perfectly preserved conditions is less than 1 million years. So, if DNA is found in a dinosaur bone then there are at least two options when interpreting the evidence. The creationist says, ‘Since we know how long DNA can last, and we found DNA in dinosaur bones, then the dinosaur bone is MUCH younger than 65 million years. This fits well with a biblical time frame.” The worldview is defined by the Bible. The atheist says, ‘Since we know dinosaurs lived 65 million years ago, and we found DNA in dinosaur bones, then there must be some unknown mechanism that preserves DNA MUCH longer than we expected.” The worldview is defined by deep time. Same evidence…but because of different worldviews, then different conclusions are reached. In the original case above, the atheists use aliens as a rescue device for their worldview since they do not believe the biblical account that humans have been smart from the beginning. The atheistic worldview is deficient in its ability to accommodate these self-existent properties. Have you ever blamed the wrong person for something? When you find out the truth, and you have to apologize for your incorrectly-assigned blame, it is definitely humbling. The world we live in has many problems and pains that we must all deal with. Where did they come from? Why does someone that I love have to hurt? These questions are answered by a worldview. 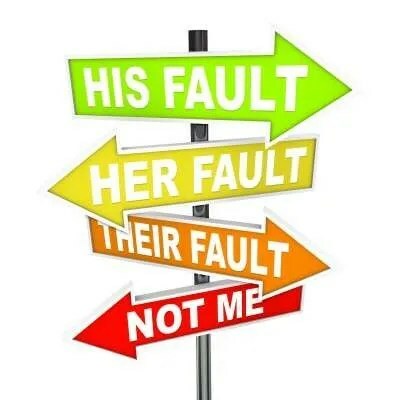 Many who believe the atheist/materialist worldview misunderstand the Christian worldview and incorrectly assign blame to God. Fry is clearly blaming the wrong party. The utter maniac, the totally selfish and utterly monstrous being he castigates is not the Creator God. It is the usurper who rules the world, whose name is devil, Satan, Lucifer. While Satan has played his part in the corruption of mankind, and continues to roam about seeking those to destroy, we will all face judgement for our own actions. Satan will get what he deserves in the end. Thankful and only by the great mercy of God, the penalty that we all deserve for our actions has been paid by Jesus, who sacrificed himself on our behalf. But we must accept this payment for our sins. At the judgement, God will punish everyone who has not recognized and repented from their disobedience and accepted Jesus’ sacrifice. We are to blame. We have all disobeyed God’s commands at some point and require help from outside of ourselves. John says in clearly in the first chapter of his first epistle. If we claim to be without sin, we deceive ourselves and the truth is not in us. If we confess our sins, he is faithful and just to forgive us our sins and purify us from all unrighteousness…But if anybody does sin, we have one who speaks to the Father in our defense – Jesus Christ, the Righteous One. He is the atoning sacrifice for our sins…We know that we have come to know him if we obey his commands. The man who says, “I know him,” but does not do what he commands is a liar, and the truth is not in him.